Bitcoin is very much in ascendancy. While it has for over three years existed as a decentralised and anonymous electronics payments system and medium of exchange for online black markets and gambling, more attempts to integrate Bitcoin into the wider economic system — most notably the integration of Bitpay with Amazon.com — have brought Bitcoin to the attention of a wider segment of the population. Alongside this, the egregious spectacle of depositor haircuts in Cyprus, and the spectre that depositor haircuts might happen elsewhere seems to have spurred a great new interest in alternatives to bank deposits in particular and state fiat currency in general. Consequently, the price is soaring — pushing up above $140 per bitcoin at the time of writing. Of course, this is still far less than a single ounce of gold currently priced at $1572. There are many similarities between Bitcoin and gold. Gold is cooked up in the heart of supernovae, and is therefore exceedingly rare on Earth. It has a distinctive colouring, is non-perishable, fungible, portable, hard-to-counterfeit, and even today so expensive to synthesise that the supply is naturally limited. That made it a leading medium-of-exchange and store of purchasing power. Even today, in an age where it has been eclipsed in practice as a medium-of-exchange and as a unit-of-account for debts by state-backed fiat monies, it remains an enduring store of purchasing power. Bitcoin is an even more limited currency — limited by the algorithms that control its mining. The maximum number of Bitcoins permitted by the code is 21 million (and in practice will gradually fall lower than this due to lost coins). Gold has been mined for over 5000 years, yet there is still gold in the ground today. Bitcoin’s mining will be (in theory) complete in a little over ten years — all the Bitcoins that there will ever be are projected to exist by 2025. True, there are already additional new currencies like Namecoin based on the Bitcoin technology but these do not trade at par with Bitcoin. This implies that Bitcoin will have a deflationary bias, as opposed to modern fiat currencies which tend toward inflation. Many people have been attracted to the Bitcoin project by the notion of moving exchange outside of the scope of the state. Bitcoin has already begun to facilitate many activities that the state prohibits. More importantly, Bitcoin transactions are anonymous, and denominated outside of state fiat currency, so the state’s power to tax this economic activity is limited. As the range of Bitcoin-denominated merchants grows, it may become increasingly plausible to leave state fiat currency behind altogether, and lead an anonymous economic life online fuelled by Bitcoins. So is Bitcoin really a challenge to state power? And if it is, is it inevitable that the state will try to destroy Bitcoin? Some believe there can only be one survivor — the expansive modern state, with fiat currency, central banking, taxation and redistribution, or Bitcoin, the decentralised cryptographic currency. The 21st Century is looking increasingly likely to be defined by decentralisation. In energy markets, homes are becoming able to generate their own (increasingly cheap!) decentralised energy through solar panels and other alternative and renewable energy sources. 3-D printing is looking to do the same thing for manufacturing. The internet has already decentralised information, learning and communication. Bitcoin is looking to do the same thing for money and savings. But I don’t think that conflict is inevitable, and I certainly don’t foresee Bitcoin destroying the state. The state will have to change and adapt, but these changes will be gradual. 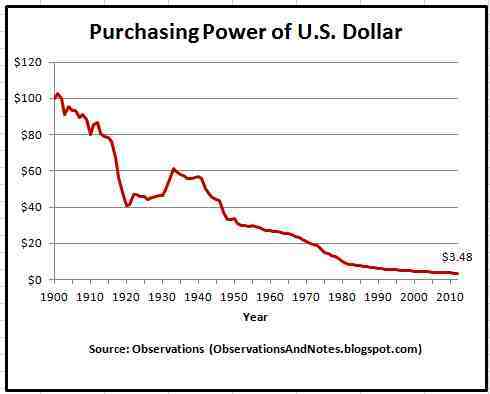 Bitcoin today is not a competitor to state fiat money, but a complement. It would be very difficult today to convert all your state fiat currency into Bitcoins, and live a purely Bitcoin-oriented life, just as it would be very difficult to convert into gold or silver and life a gold or silver-oriented life. This is a manifestation of Gresham’s law — the idea that depreciating money drives out the appreciating money as a medium of exchange. Certainly, with Bitcoin rampaging upward in price — (a trend that Bitcoin’s deflationary nature encourages — holders will want to hold onto it rather than trade it for goods and services. If I had $1000 of Bitcoin, and $1000 of Federal reserve notes, I’d be far more likely to spend my FRNs on food and fuel and shelter than my Bitcoin, which might be worth $1001 of goods and services (or at current rates of increase, $1500 of goods and services) next week. Bitcoin, then, is emerging as a savings instrument, an alternative to the ultra-low interest rates in the dollar-denominated world, the risks of equities, and a recent slump in the prices of gold and silver which have in the past decade acted in a similar role to that which Bitcoin is emerging into. (This does not mean that Bitcoin is a threat to gold and silver, as there are some fundamental differences, not least that the metals are tangibles and Bitcoin is not). This means that the state is far more likely to attempt to regulate Bitcoin rather than destroy it. The key is to make Bitcoin-denominated income taxable. This means regulating and taxing the entry-and-exit points — the points where people convert from state fiat currency into Bitcoin. The federal agency charged with enforcing the nation’s laws against money laundering has issued new guidelines suggesting that several parties in the Bitcoin economy qualify as Money Services Businesses under US law. Money Services Businesses (MSBs) must register with the federal government, collect information about their customers, and take steps to combat money laundering by their customers. America’s anti-money-laundering laws require financial institutions to collect information on potentially suspicious transactions by their customers and report these to the federal government. Among the institutions subject to these regulatory requirements are “money services businesses,” including “money transmitters.” Until now, it wasn’t clear who in the Bitcoin network qualified as a money transmitter under the law. For a centralized virtual currency like Facebook credits, the issuer of the currency (in this case, Facebook) must register as an MSB, because the act of buying the virtual currency transfers value from one location (the user’s conventional bank account) to another (the user’s virtual currency account). The same logic would apply to Bitcoin exchanges such as Mt. Gox. Allowing people to buy and sell bitcoins for dollars constitutes money transmission and therefore makes these businesses subject to federal regulation. Of course, the Bitcoin network is fully decentralized. No single party has the power to issue new Bitcoins or approve Bitcoin transactions. Rather, the nodes in the Bitcoin network maintain a shared transaction register called the blockchain. Nodes called “miners” race to solve a cryptographic puzzle; the winner of each race is allowed to create the next entry in the blockchain. As a reward for its effort, the winning miner gets to credit itself a standard amount, currently 25 Bitcoins. Given that Bitcoins are now worth more than $50 and a new block is created every 10 minutes, Bitcoin mining has emerged as a significant business. This current boom, where awareness of Bitcoin is growing considerably and many more individuals are joining the network, may soon be over. It is inevitable that at some stage the number of profit-takers seeking to cash out of Bitcoin into a currency where they can spend their profits will exceed the number of new investors trying to buy Bitcoin. At that stage, the price will fall. Just how much it falls will impact to what extent Bitcoin establishes itself as a decentralised and trusted store of purchasing power. If Groupon – a fluff co. – with 0% chance of survival was worth $20 bn. than BTC can get to equivalent ($2,000 per BTC). In my view, Bitcoin has a much better chance of being part of the future of money than Groupon ever did of being part of the future of commerce.